Nier is not as simple as it initially appears. The elaborate story features wonderfully distinctive characters, and kept surprising me with new game mechanics and ideas. I appreciated the game's self referential nature, which encouraged further analysis of the microcosm it presented. 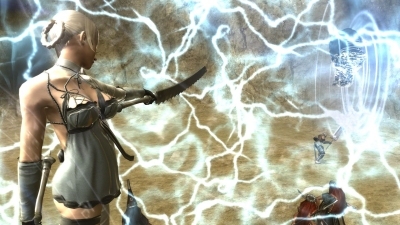 Nier's cast is a refreshing change from standard role playing stereotypes, something lived out in their interactions. 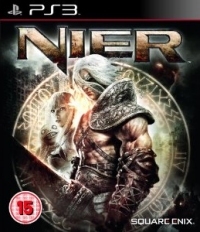 Nier is a father in his forties, and the story revolves around his quest to save his daughter from a mysterious illness. He is joined by the sarcastic magical book Grimoire Weiss, vulgar swordswoman Kaine, and a supernatural boy named Emil. As soon as I turned the game on I was treated to an angry tirade of swearing from Kaine that warned me this wasn't going to be a typical game. The characters face isolation and acceptance and all seem disconnected in some way. As a shameless geek I have a lot of memories around the difficulty of fitting in, which helped me relate to the loneliness of the characters. I felt particularly strongly for Kaine who is physically different and was bullied by the people she grew up around who consider her a freak. How easy it is to exclude people who are different and are not easily understood. Nier rallies against the segregation of his friends, and for recognition of all the good they have done for his village. But he also isolates himself a little, and keeps a distance from almost everyone. The main characters are all observers of society rather than full participants in it. As I watched these onlookers it felt like playing a miniature world within a miniature world. As someone drawn to exploring and understanding recreated worlds this was a fascinating (if slightly surreal) experience. Nier is very close to one person though - his daughter Yonah. She is his whole world and as in Heavy Rain's father-child relationship, Nier is willing to go through a desperate struggle to save his daughter, no matter what it takes. As I watched these onlookers it felt like playing a miniature world within a miniature world. While there is no doubt of the richness for study in these stereotypes, I'm getting burnt out on this self sacrificial take on what it means to be a parent. I'd relate more easily to a child who did more than simply act sick or helpless. 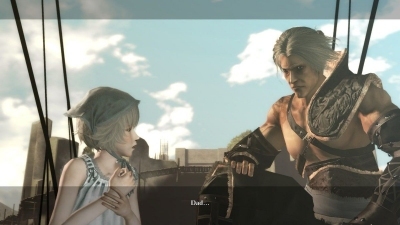 The sheer determination of Nier to bury his own identity while rescuing his daughter fascinated me - and I think led to some observations I wasn't expecting. I'm not a parent, so maybe I'm just naive, but surely children are one facet of a person rather than completely defining them. For me, you do your family more justice by nurturing yourself where you can - and parents need to help their children work out how to do this. 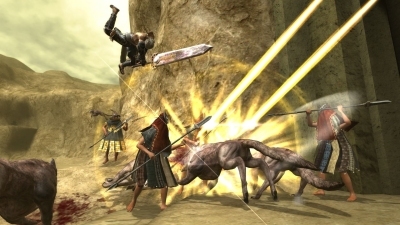 The disconnection between the main characters and the setting is part of what makes it easy for the game to indulge in fourth wall breaking and self-commentary. 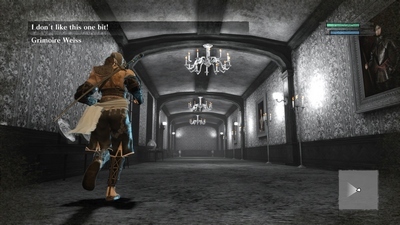 The diverse game play also includes a range of references and homages to various game genres. My usual enjoyment of games as reality in miniature is jarred here - Nier beats me to the punch and includes a running commentary on itself throughout. All of this was interesting enough, but there was more here. Early in the game I felt like I was being mocked for doing fetch quests. Weiss would utter derisive comments and make me feel like a fool for carrying out the villager's requests. I was sure the game was asking me to justify my habit of finishing side quests rather than focusing on the main story. 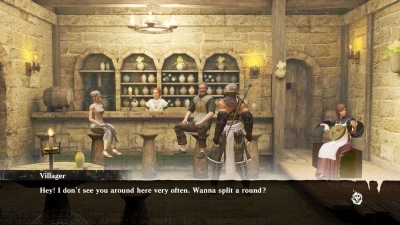 Suddenly these quests stopped feeling like grinding exploitation, and began to make connections to character's lives. 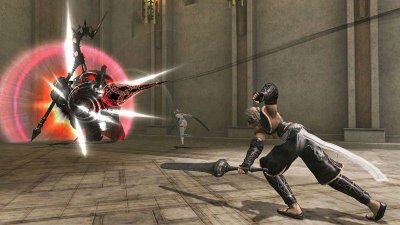 It wasn't long before Nier duly upted the interest in these optional quests and began to reveal more about minor characters. Even Weiss began to take an interest in their everyday concerns instead of mocking them. Suddenly these quests stopped feeling like grinding exploitation, and began to make connections to character's lives. Living in Nier's microscopic world I was haunted and tested to see if I would persevere with these seemingly mundane tasks. And as time elapsed, and characters grew and changed, these quests not only became more significant per se, but I also realised they were making me really feel connected to the world and my party. 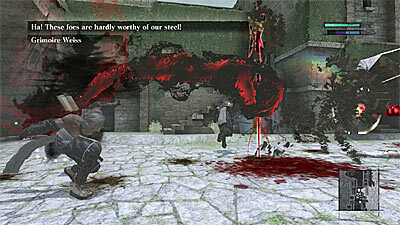 Nier has its flaws - oh the tedium of collecting rare items and combat was rarely challenging. But despite these, it held my interest. The characters were noticeably different and I wanted to know more about them. The story didn't spell everything out, which I loved. And it left me with plenty of room to speculate on my own theories and explanations. After a single play through I'm itching to return to the game and find out more of what's really going on under the microscope, and that's highly unusual for me.